Book by book, I’m reading and recommending my way through the fantastic ARCs I picked up at NCTE. I had been looking forward to C.J. Omololu’s YA novel DIRTY LITTLE SECRETS for two reasons. First, I know Cynthia online and had read about her book sale. And second, my Walker editor Mary Kate is also the editor of this book, and I know how excited she is about it. I read DIRTY LITTLE SECRETS in a single sitting — on the plane home from NCTE, actually — and it kept me turning pages long after I should have been sleeping. It’s a great, compelling read. This YA novel takes place over a mere 24 hours, but what a 24 hours it is. It’s the day when everything changes for Lucy, a girl whose mother is a compulsive hoarder. For years, that fact has shaped her life. She’s worried about the smells of her family’s kitchen following her out of the house, worried about friends who invite her to sleep over when she can never reciprocate, and worried that someone will learn her family’s dirty little secret. In the very early pages of this novel, a tragic turn forces Lucy to make a decision about how to handle her mother’s hoarding…and her own future. Powerful and page-turning, this book would be a great choice for literature circles in grades 7 and up, particularly because it has an ending that will get readers talking in a big way. I still can’t stop thinking about it. Highly recommended. 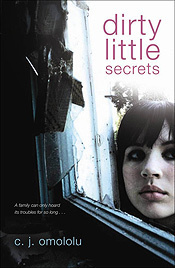 This entry was posted in Uncategorized and tagged book review, dirty little secrets. Bookmark the permalink. Both comments and trackbacks are currently closed.